A few weeks ago, ChainPoint attended the World Cocoa Foundation Partnership Meeting in Washington DC. At this event we showcased our work we do with our client Tony’s Chocolonely. During this meeting many actors from the cocoa supply chain, farmers, traders, exporters, producers and brand owners, joined the conversation on how to improve the cocoa industry for people, planet and profit. During the sessions about traceability and transparency ChainPoint was able to provide a lot of input. It became clear that the interest and importance for transparency is continuously increasing in this sector. The commonly shared belief was that by capturing, storing and analysing data from the whole chain in a secure way, all actors can learn and improve. At ChainPoint we have over a decade of experience in connecting supply chains. Some of our clients use the ChainPoint software to capture data, either with the mobile app, directly in the web environment or via an interface (API). Others use it to visualize and share information in a safe and user-friendly way. One of our customers in the cacao industry is Tony’s Chocolonely. 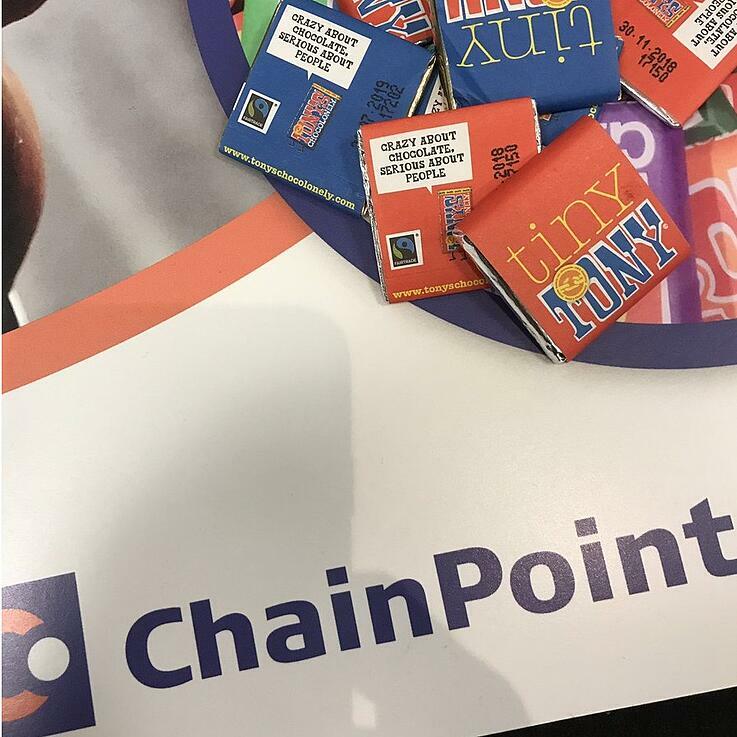 The ChainPoint software is configured for the needs of Tony’s Chocolonely and is named The Beantracker. With this platform, they are able to trace their beans from the cooperatives they work with up to processor (Barry Callebaut). This information is not only accessible for Tony’s Chocolonely but also for the cooperatives, traders and exporters. All of them can have insight in the bean whereabouts. This means that all actors can get a full overview of the quality, quantity and expected arrival time of the beans, by only entering a small piece of information. This makes the system very valuable and useful for all actors. If you are interested in a more detailed explanation of the Tony’s Chocolonely Beantracker, please click the button above to watch a video where it is explained how the use of the platform helps Tony’s Chocolonely to achieve their mission: make 100% slave free the norm in chocolate.